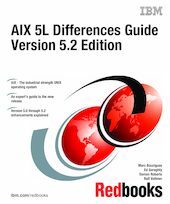 This IBM Redbooks publication focuses on the differences introduced in AIX 5L through Version 5.2 when compared to AIX Version 4.3.3. It is intended to help system administrators, developers, and users understand these enhancements and evaluate potential benefits in their own environments. AIX 5L introduces many new features, including Linux and System V affinity, dynamic LPAR, multipath I/O, 32- and 64-bit kernel and application support, virtual IP, Quality of Service enhancements, enhanced error logging, dynamic paging space reduction, hot-spare disk management, advanced Workload Manager, JFS2 snapshot image, and others. The availability of Web-based System Manager for Linux continues AIX’s move towards a standard, unified interface for system tools. There are many other enhancements available with AIX 5L, and you can explore them in this book. For customers who are familiar with AIX 5L Version 5.1, features that are new in AIX 5L Version 5.2 are indicated by a version number (5.2.0) in the title of the section.